One day, all of a sudden, you found yourself binge eating, turning to food for comfort. It was so weird and strange because it had never happened before, but now it felt like the habit had completely taken over your life. Who knew a damn cookie could have so much power behind it! Hi, I’m Macy, and this used to be my story. In college I would come home from track practice, a late night party, or even when I first woke up in the morning, and some “thing” (a demon I thought at the time) would literally hijack my body and mind, and make me stuff my face. “Oh you have no willpower. Push through. Just stop eating,” I would tell myself. But those comments just made things WORSE! How was I ever going to get my eating under control and get my happy go lucky life back? After years of self-study, Yoga & Meditation, Eating Psychology Coaching, Lifestyle Design and LOTS of change…. As my mentor Kris Ward would say, “I’M BACK!” That happy go lucky me emerged once again, and I’m so so SO excited to share my secrets to success with you. I believe my Dharma, my entire existence leading up to this point in life, is to help specifically young women who binge eat, overeat, and/or have negative body image. WE ARE SO MUCH MORE THAN THIS BODY MY FRIENDS. So here are 4 Effective & Intuitive Ways to Overcome Binge Eating Faster than you would have figuring it out on your own (Trust me, help is a good thing). 1. Slow Down & Breathe ~ It’s basically IMPOSSIBLE to binge eat when you are in a relaxed state. Think about all the times you have binged or overate… Were you ever eating slowly? Did you ever take a breath in between bites? I highly doubt it. Next time you feel a lot of anxiety and stress being built up to a binge, I want you to consciously be a witness to yourself. Notice what comes up for you. Take note of the time of day, where you are at, what you just finished doing, the last time you took a break, etc. As you are doing this take deep Ujjayi or “victorious” breaths to calm your nervous system and promote prana (life energy) to flow freely. If you don’t know how to do an Ujjayi breath, watch this video. 2. Enhance your Awareness & Presence ~ A big drive behind binge eating is to numb out to what’s really going on. There is an intense emotion of shame and guilt that causes you to act out with food, when really that’s not what the binge is about. Maybe those feelings of shame and guilt stem from negative body image, not trusting yourself, or just feeling insignificant in life. Binge eating is actually a wonderful coping mechanism that our subconscious leans toward when life gets tough. So in order to enhance your awareness and presence I suggest that you find other ways to cope with tough feelings other than food. Whether that’s going for a walk, taking a bath, reading a book, beginning calligraphy, going to a class, meditation, etc. Self-Care will always help you find balance and instead of numbing out, you will be turned on, inspired, and connected with your highest self. Know that that’s okay too. The best way to take the power away from a binge and into your own hands is to ACCEPT that in this moment, you are going to eat whatever it is that you desperately want, and you are going to ENJOY doing it. Get rid of guilt. Get rid of shame. Allow the pleasure of the ‘bad’ food (more on this next time) to fill you and that desire UP. Make the binge a ritual by using your favorite bowl, listening to music or sitting on your porch. The more aware and present you can be, so no other distractions, the better your chance of reducing the binge. 3. Embody through Movement ~ I love the idea of Movement vs. Exercise. When you hear the word Exercise, what words come to mind? I think push, prod, can’t breathe, feels bad, and can’t wait till this is over! Now, when you hear the word Movement, what words come to mind? I think walk, gentle, flow, ease, effort, energy, and wow I feel amazing during and after! My favorite way to move is with yoga. This doesn’t mean that yoga will be your beacon of hope, but I want to encourage you away from high-level stress and into relaxation. See, when the body is performing from the parasympathetic nervous system, or the relaxation response, it’s literally IMPOSSIBLE to binge. 4. Redesign your Lifestyle – I didn’t see any changes in my binge eating until I decided to take small steps toward becoming a better person, living a more fulfilled life, following my passions, and changing my physical environment. Binge eating is a symbolic substitute for other pieces of our lives that are missing or not quite right. In my upcoming audio I will break down the 8 Dynamic Lifestyle Dimensions, how they play a role in your binge eating, and some easy shifts that can improve your life right away. I hope this blog post resonated with you, and will help you begin a healing journey towards positive relationship with food and body. I know it might seem impossible now, but I’m living proof that you CAN overcome binge eating and take charge of life again! If you’re ready to dive deeper… to invest in a higher quality life and stop Binge Eating right in its moose tracks! 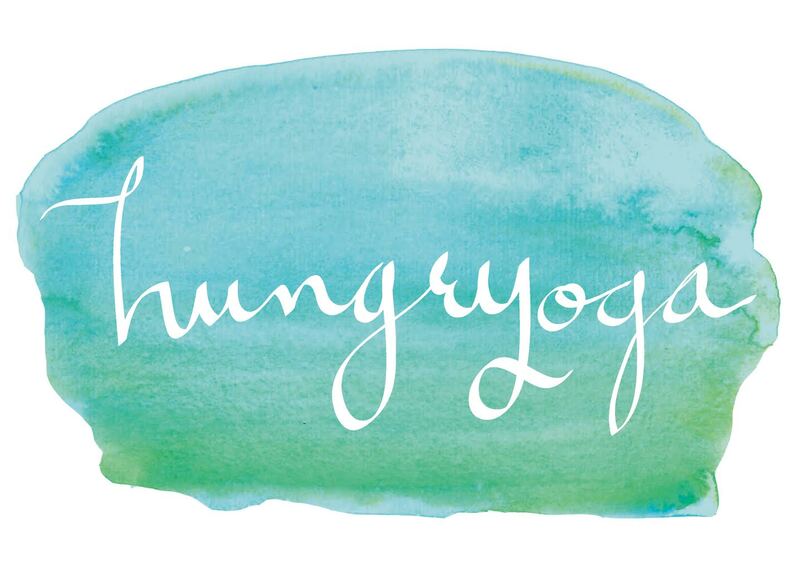 Be sure to follow @hungryoga on Facebook and Instagram for more. If you live in the Denver Metro we offer LIVE Strength, Stretch, Pilates & Yoga classes in Littleton, CO.
Do any of you find yourself desperately wanting to be pain free? This world can cause us to hold onto a lot of trauma, which manifests pain into the body. There are several techniques to become pain free. Physical therapy, massage therapy, yoga, chiropractic, pain medications, etc. A combination of these modalities can be great, but we can’t forget about the thoughts we think. Do you believe that negative thoughts can cause tension and stress in the body? Which is why I created this 15 Minute Guided Pain Free Meditation. This is a beautiful option to release any subconscious blockages, and to drop your body into the parasympathetic nervous system (aka the relaxation response). For beginner meditation my favorite yoga posture is Viparita Karani or “legs up the wall” pose. Once you get the hang of it you can sit cross legged like the monks, or lay flat on the ground in savasana (as long as you don’t fall asleep). It’s common to have feelings of frustration, sleepiness, lack of concentration, or boredom when you first begin your journey towards pain free in meditation. Stick with it. When I catch my mind begin to wander I say, “Inhale” to myself as I breathe in and “Exhale” to myself as I breath out. This really helps keep you in the present moment. The more even you can keep your breath the better. You can think 4 seconds inhale, 4 seconds exhale. When I made this meditation I kept being pain free in script for a reason. I have suffered from low back pain for several years now. If I don’t take care of myself with proper nutrition, stretching, mindful movement, and meditation it starts to flare up again. I hate to see my clients on several different pain medications or going through an unnecessary back surgery. My hope is that this meditation will give you instant relief, all on your own. Your awareness, breath, and dedication to your pain free meditation practice will also set you free.